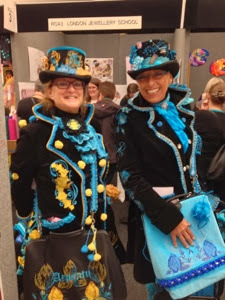 This entry was posted in Ally Pally, Costumes, The Knitting and Stitching Show and tagged 2013 on 14th October 2013 by Kathleen. 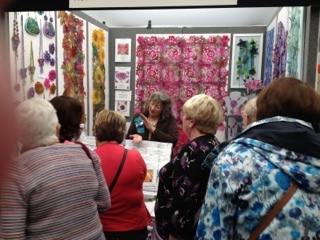 Left home to collect Julia at 6.45pm for the last day of the knitting and stitch show. Good journey down but a long day commenced with the dreaded break down at the end of it. Thankfully Julia is great at packing and balancing things on the trollies so we were out and on our way home within 35 mins and home by 7 pm. We dumped everything through the front door and bless him, hubby had tea done and a large glass of chilled white wine waiting. Putting away took me all of Monday and some of Tuesday but I’m ship shape now and ready for the onslaught of more samples for upcoming work shops. I really enjoyed the show and hopefully some new adventures will come out of it but I am glad to get back to some kind of normality. 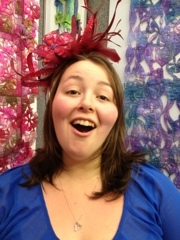 Love the picture of my daughter wearing my fascinator. She was as fresh as a daisy on Sunday while the rest of us were weary and worn out. This entry was posted in Ally Pally, Exhibitions, The Knitting and Stitching Show and tagged 2012 on 16th October 2012 by Kathleen. 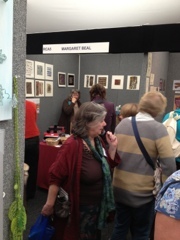 This entry was posted in Ally Pally, The Knitting and Stitching Show and tagged 2012 on 13th October 2012 by Kathleen. 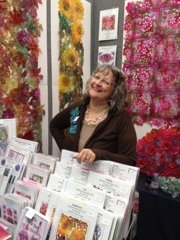 Look who dropped by my stand today at the knitting and stitching show. Pat and Mar from the Netherlands sporting their amazing costumes made specially for their visit. 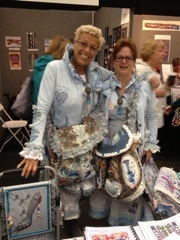 I think they looked great and was astonished by the amount of embroidery covering the clothing. I did laugh when the girls flashed me a glance under their petticoats where they had matching bloomers to match. 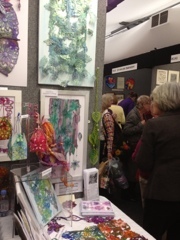 This entry was posted in Ally Pally, The Knitting and Stitching Show and tagged 2012 on 12th October 2012 by Kathleen. 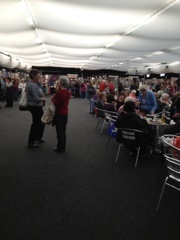 The first day of The Knitting and Stitching Show opened today and was packed all day. There seemed to be more people than last year or is it that I’m another year older and it just appears like that. Quite a odd set up this year as I am directly across the aisle from Margaret Beal of Burning Issues and I think we were both a little uneasy as to how we would do trading so close to each other. Good news is that it doesn’t appear to be an issue and we both did well for our first day even if between us we managed to bung up the isle with interested customers. Journey into the show from our hotel is terrible but thankfully it’s only once a year. Tomorrow I want to go in early so I can look at all the yummy exhibitions and find out what’s new this year. 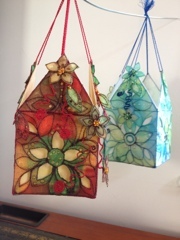 My new kits for the show are going down well with my little boxes and fan kits walking out fast. 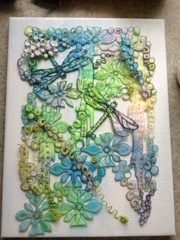 Dragonfly canvas is yet to get going and may need a push tomorrow . It’s a LOVELY kit. This entry was posted in Ally Pally, Cutwork, Exhibitions, Lutradur, The Knitting and Stitching Show and tagged 2012 on 11th October 2012 by Kathleen. Sorry I haven’t been very good with my blogs lately. In fact they have been none existent due to a really busy period running all over the country and trying to restock for the big show of the year. 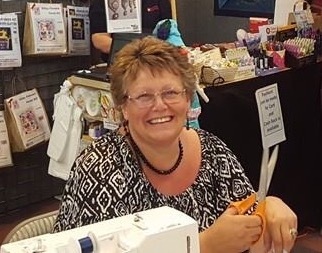 I have spent the last two weekends, one in Harrogate giving a talk to the LOVELY ladies of Yorkshire and visiting the shops where YES they have a Lakeland and last weekend I was in North Wales giving a workshop to the keen ladies of Wales. 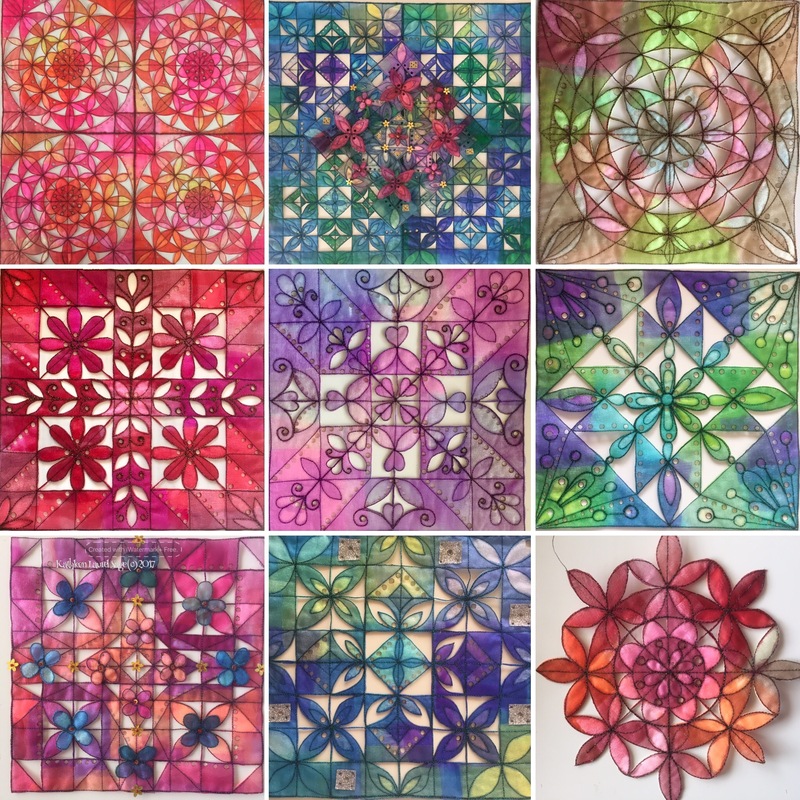 All of this week has been work work work to re-kit the stand which is going well and hopefully will leave me with time to finish some new pieces of work for my display. This weekend is looking like trouble as Julia my eldest is moving out and into her first house so everyone will be needed to help her and I doubt I will get any of my stuff achieved. Mind you next week will then be quieter so I will get things done double fast hopefully. 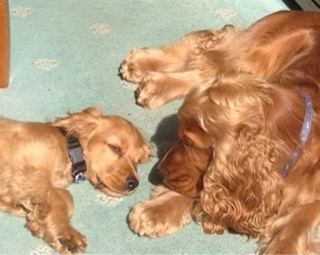 Failing that I can always get distracted by Fudge the puppy who has settled in very nicely and he and Archie the older dog are now firm friends and mischief makers. This entry was posted in Ally Pally, Exhibitions, The Knitting and Stitching Show and tagged 2012 on 20th September 2012 by Kathleen.